Rehearsals are M-W, Fri & Sat. There will be no rehearsals Dec 22-Jan 1. 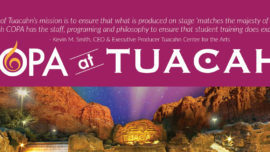 Tech rehearsal at the Covey is Feb 7 from 2pm-10pm. Performances are Feb 8 & 9. Utah COPA is a best of state performing arts conservatory that develops talent and confidence across voice, dance, songwriting and musical theatre. Utah COPA: Utah Conservatory of the Performing Arts. Copyright © 2017-2018. All rights reserved.